Picture in your head a restaurant called “Frank’s Eats.” Across the street, picture “Le Bistro.” Without any further information, you already know a lot about each of these establishments. You already know quite a few of the things on each menu, you know how the lighting will differ, and you can probably guess how likely you are to leave each establishment with heartburn. My point here is that the name of a restaurant says a lot. While in Phoenix not too long ago I was looking for a place to grab a sandwich and came upon the listing for Los Reyes de la Torta. The Torta Kings. This wasn’t a signal of the menu or the cleanliness, this was a signal of attitude. This was a restaurant founded by two or more individuals with such faith in the quality of their food that from day one they announced themselves as the reigning sandwich sovereigns of Phoenix. This is, to say the least, a bold claim. While I have not eaten every torta in Phoenix there was nothing at Los Reyes de la Torta to lead me to believe they were not all that they claimed to be. 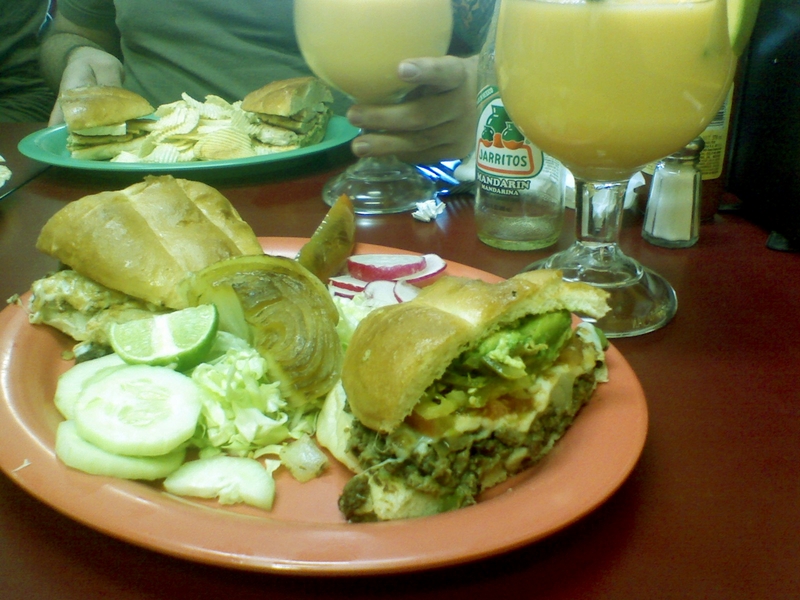 The chopped beef torta was piled high with grilled steak, cheese, onion, tomato, jalapenos and avocado. The flavors produced a fine harmony, and a wide, soft telera kept everything under control. I admire the kind of people who run Los Reyes de la Torta. They do something, they do it very well, and they aren’t afraid to let you know about it. This entry was posted in Sandwich Reviews and tagged Beef, Phoenix, Reviews by Pete, Sandwiches I Have Eaten, Sandwiches Made For Me, Torta by Pete. Bookmark the permalink.